Thousands of people gathered in line outside of the Toyota Center Monday afternoon hoping to secure a spot inside the 18,000-seat arena. U.S. Sen. Ted Cruz defeated Democratic challenger Beto O'Rourke in the race for U.S. Senate. View full 2018 Texas election results or subscribe to The Brief for the latest election news. Decked out in signature red baseball caps, thousands of President Donald Trump's supporters assembled in an hours-long line Monday in the streets surrounding Houston’s Toyota Center arena ahead of an evening rally featuring Trump and a slate of statewide officials. The rally was for U.S. Sen. Ted Cruz, a Republican incumbent fighting an unexpectedly tight re-election campaign against El Paso congressman Beto O’Rourke. But the focus — despite the dozens of Republican campaign staffers stationed throughout the line to encourage straight-ticket voting — was on the president. “Women for Trump.” “Cubans for Trump.” The president’s face and name was on hats, T-shirts, pins and flags draped around bodies. 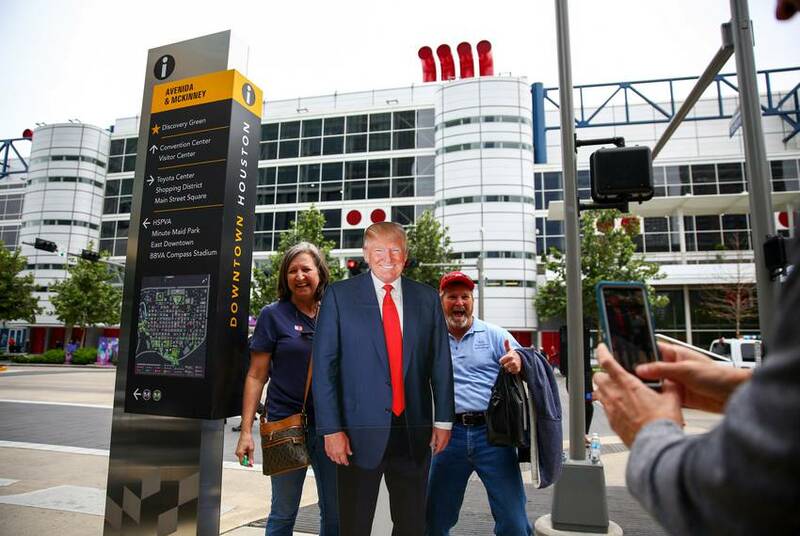 One person waiting in line, J.R. Roberts, of Sugar Land, took the Trump-themed merchandise a step further, positioning a life-sized cardboard cutout of the president next to her. She laughed as supporters flocked to her to pose with her and her cutout. A largely white crowd in the country’s most diverse city, Trump supporters snacked and smoked, snaking their way through a line whose end was difficult to locate, confusing the hundreds who had gathered for an unrelated National Safety Council conference at the neighboring George R. Brown Convention Center. 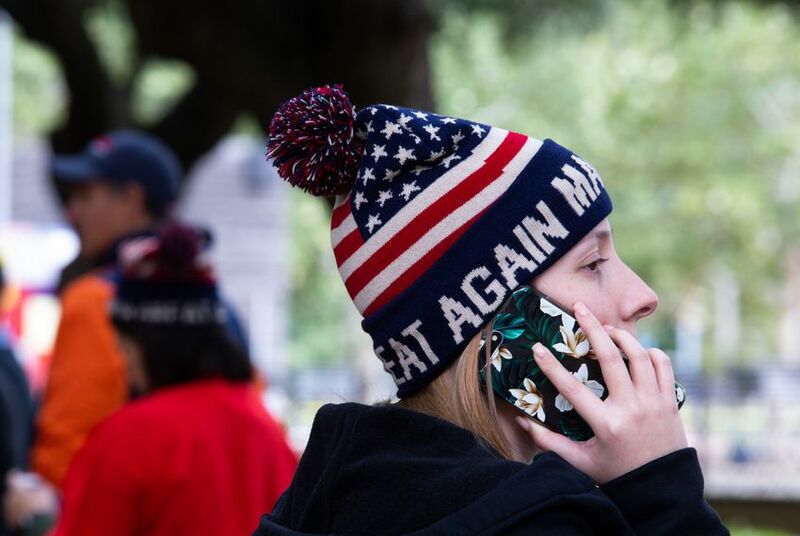 Some supporters had traded their signature red baseball caps for knit “Make America Great Again” beanies as they waited outside in the chilly weather, hoping to earn a spot Monday evening at the 18,000-seat arena. Tens of thousands more had reportedly sought tickets. Helen Conner, a 71-year-old wearing a “Classy Republican” shirt underneath a heavy coat, drove in from Lufkin with two of her friends from elementary school. Like many others in line, Conner said that, while the president was the “catalyst” that brought her to the rally, she is “100 percent behind” Cruz. If Cruz-focused attendees were scarce, fans of neither Trump nor Cruz were even more rare. Lynn Dahlberg, 72, stood alone in a black t-shirt that expressed support for O'Rourke, a sticker bearing the El Paso congressman’s name stuck to her knit cap. “Welcome to Houston,” she said cheerfully, waving a pair of homemade cardboard signs advocating for Obamacare and DACA. One man walking by rolled his eyes. “That’s not why we’re here,” he said. Dahlberg was on her way to a specially designated area for protesters in a park next to the Toyota Center. There, a handful of protesters and counter-protesters gathered — separated by a metal barrier and a wall of police officers in the middle — hurling insults at each other through megaphones. “I don’t think we should have a president who normalizes racism,” Flores said. For some, participating in the rally and the protests wasn’t the point. She got up at 3 a.m. to make the drive in from Lake Conroe, but didn’t plan to join the line. “We thought, ‘We’ll just tailgate,’” she said. Will Donald Trump's Houston rally for Ted Cruz motivate Republicans — or Democrats?